Everybody who is interested in internet marketing knows that video has been super effective for several years now and that YouTube is still king-of-the-hill. YouTube was probably one of the smartest, if not the smartest acquisitions that Google ever made. Although I'm not a fan of their high-handed attitude toward customers (I've had an account blacklisted for over three years now and I still get zero meaningful response when I inquire about getting it back) but, I recognize that video marketing is still very effective and YouTube is where we need to be. It's gotten very easy to produce good, raw, video content. Today's smartphones make raw videos of better quality than Hollywood cameras did 50 years ago. But there's more to a good marketing video than just the images. A good script can separate a home-run sales video from a 'ho-hum' sales video yet it's the one thing that no 'smart' device can do for you. The point is that you need to be able to produce properly formatted and paced video scripts quickly in order to be able to bring products to market quickly. Why reinvent the wheel when you can follow the guidelines I'm going to give you here to crank out all the scripts you need to turn your videos into money machines? That's what I want to share with you here: an outline of a typical sales-video script. These aren´t my ideas either. I actually got them from a very sharp internet marketer named Jim Edwards. Jim isn´t as active on the internet today as he used to be but he was very prominent on the internet back when I first got online (around 1998). He was very innovative for his time and helped a lot of people. Grab the viewer's attention. For example, "Attention— anyone who's bought any kind of graphic software in the last 6 months!" Define your topic. Tell the viewer what they'll learn by watching the video. Define yourself, your product, or your service as an agent of change. Example: "In this video you're going to learn a quick, easy, free way to create graphics for your websites, social media, and other web purposes and stop wasting time and money on methods that just don't work." 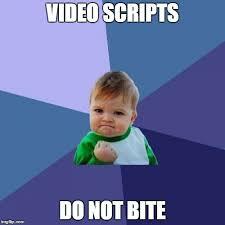 Tell them what you are going to cover in your video. Example: "In this I'm going to show you the professional way and the easy way….and you'll see that the easy way is better!" Tell them who the video is for. Call them out by their name, the type of group they belong to, the problem they have, or the results they're looking for. For example, "If you've ever wasted time and/or money with outsourcers or expensive graphics software that promised the moon but delivered nothing… you'll love what I'm going to show you. Matter of fact, all my sales and webinar graphics were created with it." Who is the ideal person who will buy from you? For example: "Whether you the busy professional online marketer who needs to get projects through development quickly and as economically as possible or if you're a beginner who needs a simple tool and method you can do totally on your own time school as you follow your muse…this webinar is for you." Define the money cost. For example, "Oh yeah…did I mention that this basic method is free or, if you want a few upgrades you can spend maybe a max of $20 one time." How much cost is involved for your customer? Define their time cost. For example, "If your time is valuable, like mine, you'll love the fact that most any graphics project you'll every need to do can be done in an hour max." Define their #1 need. For example, "The most commonly needed product on the internet today is blog headers and social media graphics, both of which this method and tool handles wonderfully." Note: It's frequently a good idea to insert your story somewhere if you have time to do so. Here would be one place to do it. For example, "Here's what I went through on my first two products before I learned what I'm going to show you in this webinar." Identify the villain they face. For example, "For most beginners, the biggest villain they fact is a complex learning curve and user interface… just like the frustration I just described. Neither of these factors is a problem with what I'm going to show you in this webinar." Define the pain they feel now or will feel. For example, "Believe me, I know what it's like to be all excited about a new piece of software but then get it home and unboxed and find out that you need an engineers degree to figure it out." Identify their #1 misconception. For example, "If you think you won't be able to do this, you already know how I use it. But just look at these example of what some of my other students have done for their blogs and social media sites… and you can do the same thing too." Identify the results they want. For example, "No matter what style of graphics you need, you'll be able to do it after this webinar." Define why they should act now. For example, "The software I'm going to show you tonight is based on the latest technology that only a few advanced marketers have even seen yet. By taking advantage of the unbeatable offer you'll see at the end of this webinar you'll be way ahead of 99.99% of your competition in getting your products to market." Be sure and tell your story of 'unable to able'. Add a specific Call to Action at the end of the video. Edit everything to the required length for your video's format and purpose. So, these are some key elements of most videos. Of course you have to adapt these ideas to your product, service, or purpose and time constraints are certainly a factor. But just keep in mind that each of these tips accomplishes a specific purpose and/or answers a question that's going through your viewer's mind. With time, you'll be able to cover all these bases very efficiently million dollar video scripts that turn your videos into money machines. I'll be looking for your videos on YouTube!